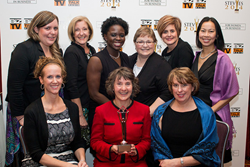 Winners in the 2015 Stevie Awards for Women in Business. Nations represented at the event include Australia, Bulgaria, Canada, India, Israel, Japan, Lebanon, the Philippines, South Africa, Spain, the United Arab Emirates, the United Kingdom, the U.S.A. and Venezuela. The 2014 Gold, Silver and Bronze Stevie Award winners reflect a diverse group of large and small organizations from around the globe. Organizations that won more than one Gold Stevie Award include Accenture, Bitsy’s Brainfood, Dubai Police General HQ, LLORENTE & CUENCA, MWW, Nerium International, Newberry Executive Solutions, LLC, and Xceed Financial Credit Union. For a complete list of Stevie Award winners and more information, visit http://www.StevieAwards.com/Women.